Preheat oven to 375, convection where available. Melt butter. Combine all ingredients in a large bowl. Work/kneed in flour to sausage until all ingredients are combined. Dough should be pink in color and slightly sticky. Roll into balls and cook for ~20-25 minutes depending on size. Balls will be slightly golden brown on top when done. Optional: add veggies like bell peppers, onions, carrots, etc. Or you could leave out the veggies and throw in an apple. Throw everything in a skillet, stirring often, let the potatoes cook until they are soft on the inside and a little crispy on the outside, about 10 minutes but could take much longer depending on how big you cut up the sweet potatoes. Add a TON of cinnamon and serve. Recipe found here: http://everydaypaleo.com/2010/09/25/baa-baa-breakfast/. If you don’t have her book Everyday Paleo yet, go buy it! It’s a great cookbook. Combine first four ingredients and place in cooked pie shell. Mix eggs, milk, salt and pepper, and pour into pie shell. Bake at 375 degrees for 30 minutes. In a heavy 7 to 8 quart pot or kettle, melt the butter over low heat. Add the vegetables, parsley, ham, and pork and brown over low heat, stirring constantly, for 15 minutes. Ad the sausage and seasonings, mix thoroughly, and continue cooking over low heat, stirring frequently for 20 minutes. Add the rice and raise the heat to medium. Cook for 5 minutes or until the rice is lightly browned, stirring and scraping the sides and bottom of the pot. Add the beef stock and mix gently. Raise the heat to high and bring to a boil, and cook uncovered for 5 minutes, then cover the pot , lower the heat to low, and cook for 50 minutes, removing to cover to stir every 5 minutes or so. 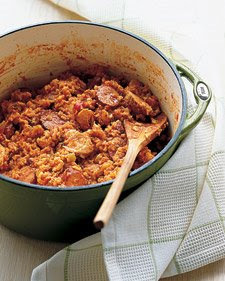 If you notice the jambalaya getting too dry, add ¼ to ½ cup water after about 25 to 30 minutes. Uncover the pot during the last 10 minutes of cooking and raise the heat to medium to allow the rice to dry out.